While eating Potato Leek Soup at Masa, I couldn’t help but start craving my mother’s Stilton Potato Leek Soup. So, Masa’s soup was definitely worthy of a Form of Flattery post! In which, the taste of something lingers to the point that I must try to imitate it at home. Her recipe is simple, foolproof, customizable, and delicious. 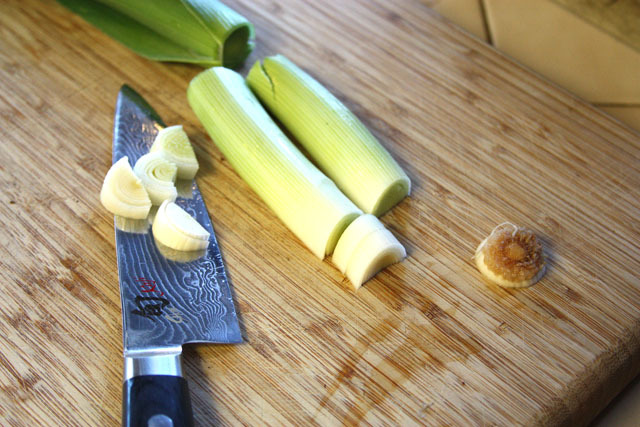 Cut off the tip and the greens of your leek so you just have the thick section in the middle. Halve that piece and chop coarsely. Once this is done, soak it in water for a minute, twirl it around, and drain in a strainer (you will be surprised and grossed out by how much dirt and sand hides in leeks and glad you did this extra step). Peel and dice your potatoes (the smaller you cut them, the less cook time you will have) and saute them with the leeks for a few minutes with some extra virgin olive oil. I was making a 2 person portion of this soup, so I used 2 leeks and 2 potatoes, but you can adjust by taste and quantity. After you are done sauteing, cover with chicken broth (if you are a vegetarian, vegetable broth will work just fine). Fill your pot until potatoes are just covered and let simmer for a half hour or until potatoes are tender. 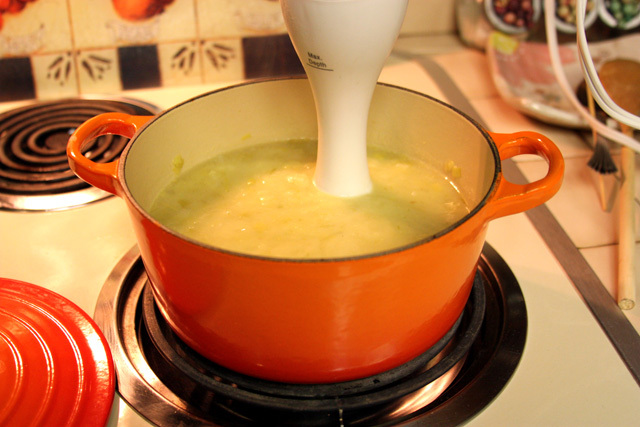 Pull out your immersion blender and go to town (if you don’t have one and like soup, get one.. this one was under $15 and trying to use a blender to make soup just isn’t worth the time and mess). 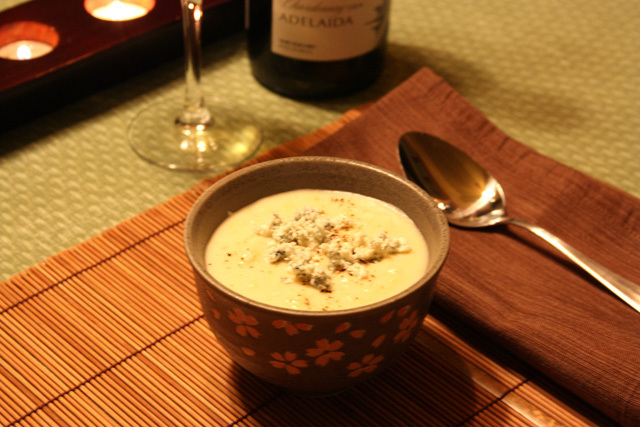 Add Stilton cheese to taste (I like a lot). I love the taste of “stinky cheese,” but this would be good with a variety of cheese.. experiment! The cheese alone makes it creamy enough for me, but if you want a “more fat” option, you can add some heavy cream. If the soup is too thick, feel free to cut it with some more broth until you have the consistency you desire. Sprinkle with some freshly ground pepper, garnish with some extra cheese and bon appetit! Step 1: Chop and rinse leeks. Step 2: Peel and cut potatoes. 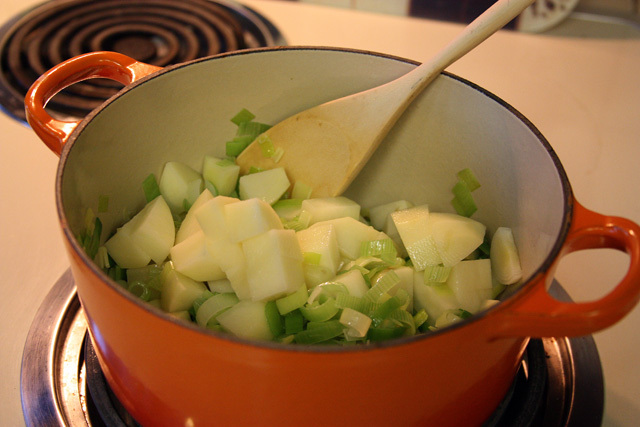 Step 3: Saute in extra virgin olive oil until leeks are tender. Step 4: Pour in enough chicken broth to cover potatoes. Step 5: Boil for a half hour or until potatoes are tender. Step 6: Emulsify and add more broth/cream to desired consistency. Step 7: Stir in cheese to taste. Step 8: Garnish with freshly ground pepper and cheese and enjoy! wow it looks soo yummy!!! ooooooooooooooh, this looks delicious! sometimes potatoes in soup give me the willies. i don’t know why — must be the texture if they are too hard or something. but i get over it if the soup around it tastes delicious!